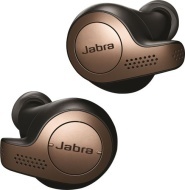 alaTest heeft 4 reviews verzameld en geanalyseerd voor Jabra Elite 65t. De gemiddelde beoordeling voor dit product is 3.2/5, vergeleken met een gemiddelde beoordeling van 4.0/5 voor andere Koptelefoons. Gebruikers waarderen de afmetingen zeer. Consumenten beoordelen dit product gemiddeld met 64/100. Better battery life, better comfort – but not quite the best sound in this class. Step aside, AirPods! Jabra's Elite 65t are the fully wireless headphones to beat. With solid sound, great battery life, and intuitive features, the Jabra Elite 65t easily rank among the best fully wireless options on the market. Good passive isolation. ; Stable and breathable for sports. ; Good range and wireless connection. Not as comfortable for everyone. ; Mediocre build quality for the case. Jabra's new truly wireless earphones are superior to the AirPods in some ways and only cost a little more. The relatively tight, noise-isolating fit isn't for everyone. You have to step up to the more expensive Elite Active 65t to get a true sports model that offers enhanced sweat-resistance. The well-designed Jabra Elite 65t truly wireless earphones rival Apple's AirPods and are superior in some ways. The Jabra Elite 65t are a reliable pair of earpods, that fit perfectly in the ear and offer a great audio experience. Here's our full review. Small and lightweight, secure and comfortable fit, charging case, companion app, impressive audio quality. More expensive than Apple AirPods, seal means you can hear footsteps through your head, earbuds drop out sometimes.